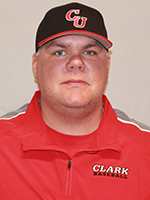 JP Pyne took over at Clark University after many successful coaching stints leading to the culmination of the head coaching position at Clark. Prior to Clark, Coach Pyne spent two seasons at Maine, helping lead the Black Bears to consecutive America East Tournament births. Coach Pyne was named NECC Coach of the Year in 2009, 2010 and 2013 for his work at Daniel Webster, while 24 student-athletes earned All-NECC honors, including 19 first-team selections. The MBCA is thrilled to have Coach Pyne share his well-tested and successful practice planning ideas with the association.